Here at Bulichella, your dogs (small and medium-sized breeds) are welcome! In the rooms and apartments located in the Gabella farm hourse (400 m from the main building), you may stay in the company of your four-legged friends, but you must inform us of their presence and type when booking. Although dogs stay free of charge, we do request a cleaning fee that ranges from € 10 to € 20 depending on the duration of your stay. In dedicating the Gabella area to our canine clientele, we have sought to harmonize and respect all our guests’ needs. We thus recommend that all those accompanied by their dogs comply scrupulously with the rules of respect for other guests (some of whom might not appreciate the presence of dogs), by bringing along a muzzle and not letting their pets off leash in the common areas adjacent to the farm yard or near the lodgings. We also ask that, in the lodgings, dogs not be allowed to climb onto beds or sofas; if this cannot be avoided, bring a sheet or blanket just for your pet. Dogs are admitted to the restaurant and terrace for breakfast, but must be kept on leash and near their owners’ table. It is forbidden to leave a dog unaccompanied in the lodging. Although we are in the country, you must pick up after your dog, particularly in the farm’s common areas and on the access roads. Waste baskets are available for disposal of used bags. Please take the appropriate precautions with regard to fleas and ticks, which are always frequent in the country, especially in the summertime. On this part of the Tuscan coast, dogs are permitted in indicated areas on much of the open beaches. There are also two full-service beaches dedicated exclusively to guests with dogs: Dog Beach San Vincenzo (www.dog-beach.it) and Pascià Beach Perelli (www.pascia.biz). 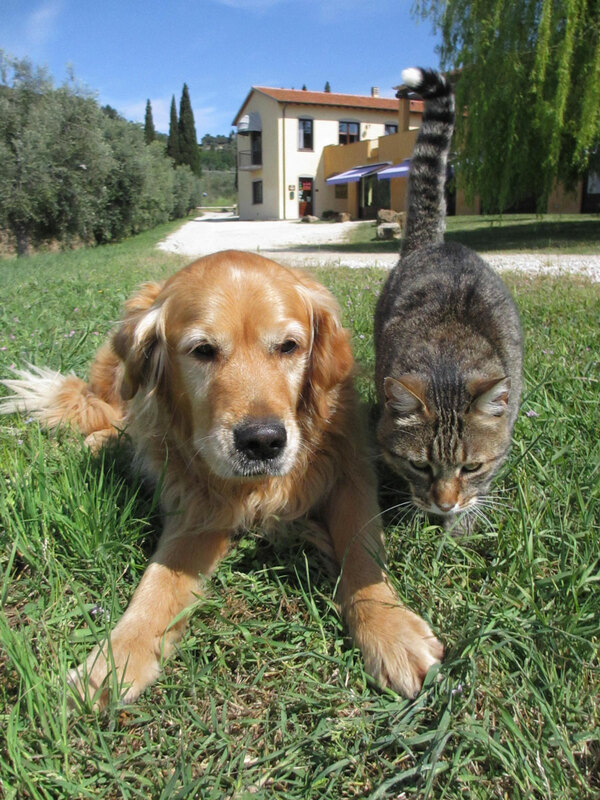 In Suvereto and in Val di Cornia, dogs are welcome in almost all bars and restaurants.